MOBOTIX is an impressive company with an impressive line of products. MOBOTIX has been a leader in creating high quality security cameras with low bandwidth since 2000. Their techniques in creating powerful cameras has built trust in their customers and has ultimately saved customers more money then they invest. The need for security and piece of mind is everywhere, MOBOTIX brings that to residential homes, office buildings, sports stadiums, airports, prisons, schools and more! With it’s wide array of features and value added to our customers, Highland Wireless is proud to be a dealer and installer of MOBOTIX IP Network Cameras. 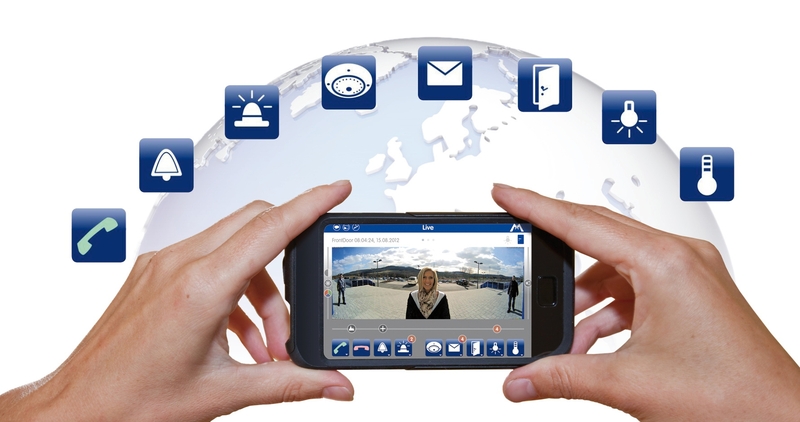 What are the advantages of MOBOTIX IP Network Cameras vs. its competitors? Beside the professional VMS and video analysis software, MOBOTIX is known as an innovative producer of smart and autonomous IP cameras. From the beginning, cameras were equipped with CMOS sensors without any moving parts to improve backlight situations and longterm reliability. The camera itself runs the software for automatic event detection, alarm messaging, video analysis, direct NAS ring buffer storage and remote functions. Two-way audio with VoIP messaging and phone connectivity using the SIP standard is included in all MOBOTIX IP Network Cameras. From the first day, MOBOTIX cameras are produced weatherproof and IP66 protected with one of the highest quality standards. In 2015, a new range of competitive 6-megapixel indoor cameras for flexible ceiling and wall-mount installations was launched. MOBOTIX cameras are made to be headache free and to give full control of the product to the customer. MOBOTIX IP cameras have been optimized for remote applications and cloud-based technology because the cameras can reduce the bandwidth of the video by scaling the size and the frame rate. Image details are still available thanks to the onboard virtual PTZ functionality. So the cameras store high-resolution video onboard and deliver on demand low- bandwidth live images and also low-bandwidth playback. All from your phone, you can see what your camera sees and watch multiple streams. MOBOTIX makes overseeing a facility or keeping a building secure easy for the customer. For any security situation, MOBOTIX has a wide array of camera lines to fit any need and any budget. In situation of high risk, such as in a prison, MOBOTIX builds cameras that are vandalism proof and bullet proof. For outdoor environments such as a parking lot MOBOTIX builds weatherproof cameras that can work in -22 degrees to 140 degrees Fahrenheit. Low light areas are non-issues for MOBOTIX’s thermal cameras. The thermal camera is the best tool to detect and report moving objects in complete darkness automatically. The thermal camera can activate automatic alarms and messages if the temperatures in user-defined areas differ from the default range. The thermal image can be overlayed on the visual image to localize the hot spot. For more information, please give us a call at (954) 376-7400. We at Highland would love to show you our many options and work with you to find the best solution to fit your needs!